Spy isn't a bad film. But it's only half a good one, says Paloma Sharma. This one's going to be difficult. Paul Feig, brilliant director of equally brilliant films such as Bad Teacher, Bridesmaids and The Heat, tries his hand at action for a change with the Melissa McCarthy-Jason Statham starrer Spy. Entertaining as the action is, Feig and McCarthy break hearts of long time fans with comedy that seems more forced than funny. Spy re-imagines the generic action thriller, questioning several stereotypes along the way, but ends up feeling like a bit too much by the time it reaches the end of its two hour run time. 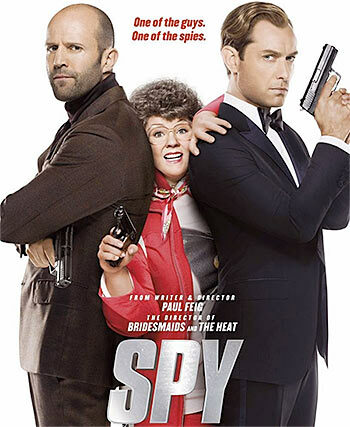 Susan Cooper (McCarthy), a CIA analyst stuck in a dead end desk job in a vermin-infested basement, is madly in love with Bradley Fine (Jude Law), the on field spy she plays tech support to. When Fine is murdered by nuclear arms dealer Rayna Boyanov (Rose Byrne) and the identities of other agents are compromised, Cooper leaves the safety of her basement office for the first time to avenge Fine and stop Rayna from selling the nuclear weapon to terrorists. A tad predictable from the beginning, Spy isn't as solidly scripted as Feig and McCarthy's last collaboration, The Heat. While it seeks to mock the usual action thriller, it becomes a tedious watch with all the crossing and double crossing and the not entirely convincing plot twists. On that note, I should probably also mention that people get shot by unknown people at times that are awfully convenient for our leading lady. However, Feig makes up for it by providing the viewer with some of the coolest action sequences that have been witnessed this year. Were this an out and out action flick, it could have done so much better. Adding misplaced, worn out jokes to it just kills the charm. The usually, stomach ache-inducingly hilarious McCarthy is rather restrained in Spy. Although you see parts of her character from The Heat begin to shine through towards the end of the film - moments that she seems to personally enjoy - it's too little, too late. Despite McCarthy being the star of the film (and Jude Law at his pouty best), it is Jason Statham who steals the show. Statham spoofs the tough guy characters he plays in all his films with a face so straight that you'd never be able to tell whether he was joking. His performance is definitely worth going through Spy for. Statham and McCarthy share great chemistry that could have been further explored. Their scenes together were the funniest in the film and one wishes one could have watched more of that. Instead, McCarthy is paired off with Rose Byrne and Miranda Hart - another worthy comic who could not reach her potential in the film - and the spark just isn't there. You can't help but wish for Sandra Bullock to step in and take stock of the situation. Armed with a catchy soundtrack, the film hits the right notes with its bloody, graphic and smoothly shot action sequences but fails to tickle your funny bone. That isn't to say that Spy is a bad film. But it's only half a good one. As much as it breaks my heart to say this about a Feig- McCarthy project, Spy would have been a more honest film were it titled Get Smart-ish.